May 18, 2015 – The Glenrothes only releases one new addition to its Extraordinary Cask Collection each year, and this year’s release comes from a single cask filled at the Rothes distillery on November 19, 1968. Cask #13507 was a second-fill ex-Sherry hogshead, and produced just 148 bottles at 41.9% ABV when it was emptied. 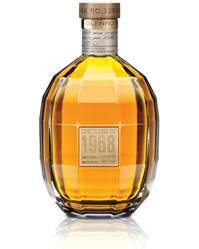 It’s the third release in the series, following the release of single casks from 1970 and 1969. The whisky comes in a hand-blown Portuguese crystal decanter with a stopper that includes wood from Cask #13507. 28 bottles will be available in the US, where it will carry a recommended retail price of $9,250 USD. Pricing and availability in other global markets was not immediately available.